Stable. Elegant. Durable. Regardless of how you measure the quality of a stand, OMOTON stand is always better than you expect! 1. Superior Stability: We adopt 3mm thickness aluminum material to guarantee the stability. It is 3 times more sturdy than other stand. 2. Adjusted Angle Viewing: Multiple Angles could be adjusted (180 degree rotating) to meet your different viewing demand in different occasion. 3. Anti-Scratch & Anti-Slippery. Enlarged anti-scratch silicone pad provide you decent protection even your phone case is removed, also anti-skid from tipping over. 4. Heavy Case Compatible: The stand's hook length is 18mm, which is large enough to hold your device with HEAVY CASE on. 5. Suitable Height to hold the cable when charging from damaging it. 6. Excellence on details. Similar CNC technology as Macbook adopts, you could enjoy the comfortable sense of touch even on the edge. OMOTON is always surpass your exception! 7. Keep your desk in order. 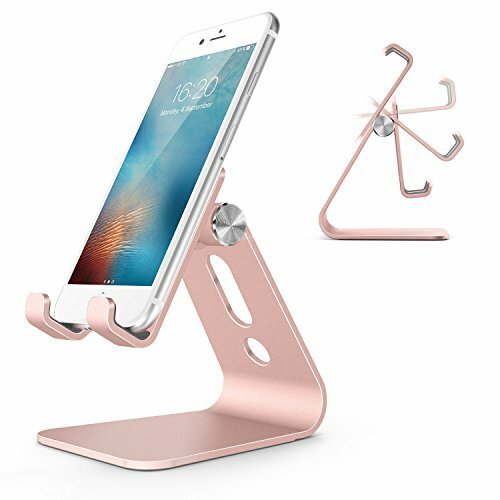 Put this cell phone stand on your office table or night stand to make your device prominent. No need to find them all the time and never tip over when tapping on the device. OMOTON, Better than you expect! 2. Superior Stability: We adopt 3mm thickness aluminum material to guarantee the stability. It is 3 times more sturdy than other stand.